Phew....what a busy couple of days! Szilvia & Stuart, are getting married at the very beautiful Oakley Court Hotel today, they are also moving to the States later this year, and expecting their first baby in Febuary....what a busy time ahead! 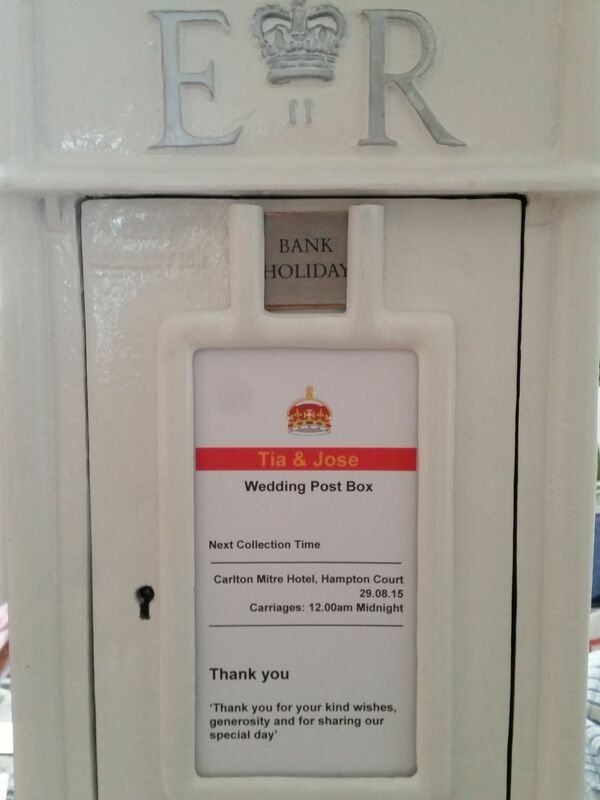 They hired by lovely silver 75cm candelabras and original white postbox with silver lettering. Samantha & Marc, who are getting married at the very stunning Great Fosters today. They also hired a white original posbox with gold lettering, love their colour theme, especially the gold glitter card! Rhodri & Lizzie, who are getting married at Devonshire Terrace in London, what an amazing venue! They also hired one of my white original postbox. Love your tandem theme and colour scheme! And finally to Tia & Jose, who are getting married at The Carlton Mitre in Hampton Court, what amazing views.......they also hired a posbox! Many congratulations to Rosie & James!